We read a lot about social media apps these days but the best social tool is one you've had all along, your phone. 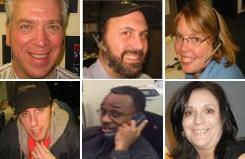 Applause Theater & Entertainment Service is the most "social" ticket service company there is. Why? Because we love to talk! Our new website promotes your ability to call our team of Theater and Entertainment experts 24 hours a day, seven days a week to discuss your or your client's entertainment needs. You will never receive an automated voice message system when you call. Instead, a live person will actually answer the phone! Go ahead and try it. Our professional staff is here to help you choose which Broadway shows to see. Because we live and work in New York City, we get to see them all and can give you a great recommendation and answer all of your questions about the shows that you are interested in. We can also advise you on the best seats, where to park your car, and recommend restaurants nearby where you can grab a delicious meal before the show. It's not easy to find all this information on your own as quickly as speaking to a live personal assistant. So give us a call and let's talk! 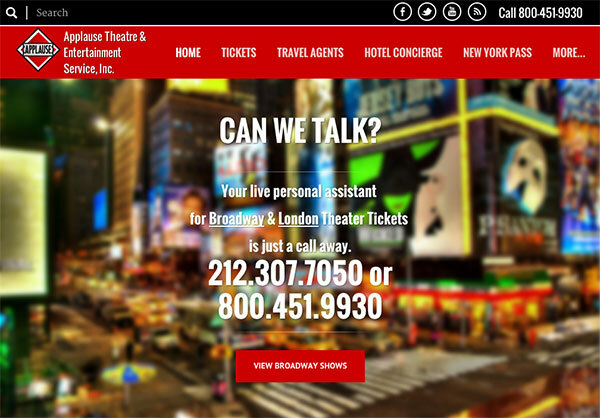 Buying tickets on Applause is as easy as View, Click, Call with our fresh new look and user-friendly navigation. 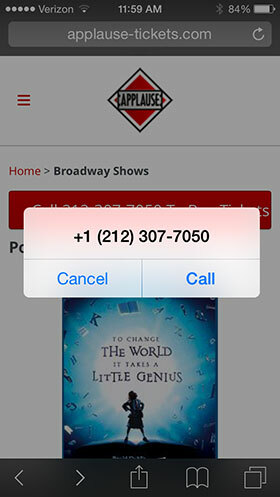 In three clicks or less, find the shows you're interested in and call to speak to a representative to buy your tickets. Buying tickets on your phone has never been easier with our new mobile friendly website. Click the Call buttons and your phone will dial our number for you. This works on all iPhones, Android, and Windows phones as well as most tablets and computers*. *Click to call feature is compatible on Apple computers through FaceTime Call. Computers running Windows may require a third party plugin such as Skype, Google Talk, etc., to make calls through your computer. Our live chat service has gone mobile! 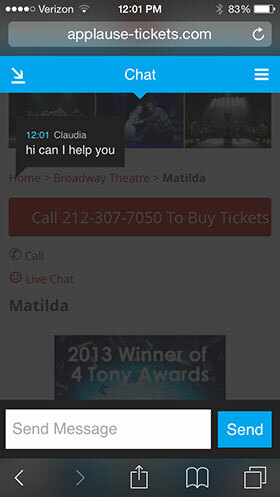 In addition to using Live Chat from your computer, now you can enjoy speaking to a live representative from your mobile phone using our beautiful new live chat interface. Look for the "Live Chat" links from your computer, tablet, or mobile device to chat with us online. Applause sells tickets to all events nationwide including sporting events, concerts, theater and more. View live inventory for any show and any event in the U.S.A.
We'd love to hear from you and get your feedback on our new website or answer any questions you may have about a show you want to see. Fill out our contact form on our contact page or give us a call at 212.307.7050 or 800.451.9930.